We really don't know much about the first 'hospital' in Yeovil. As early as 1693, the Churchwardens' Accounts show an entry of payment of £2 13s 4d for "Hospitall Money for Maimed Souldiers" although there is no indication that the hospital was actually in Yeovil or it was simply part of a nationwide 'collection'. The Yeovil General Dispensary, a precursor to later Yeov il hospitals, was instituted in March 1858 at the suggestion of Dr Elias Taylor Warry. It was housed in a cottage in Kingston. 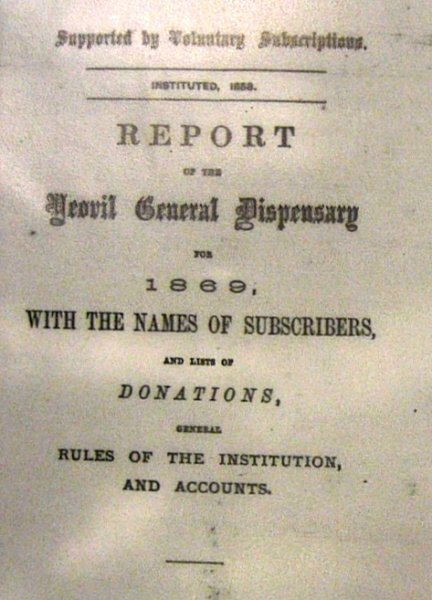 You will oblige me by inserting in your paper the accompanying report of the income and expenditure of the Yeovil Dispensary for the past year, ending 31 December 1859. You will observe I have a balance in hand of £7 16s 8d. 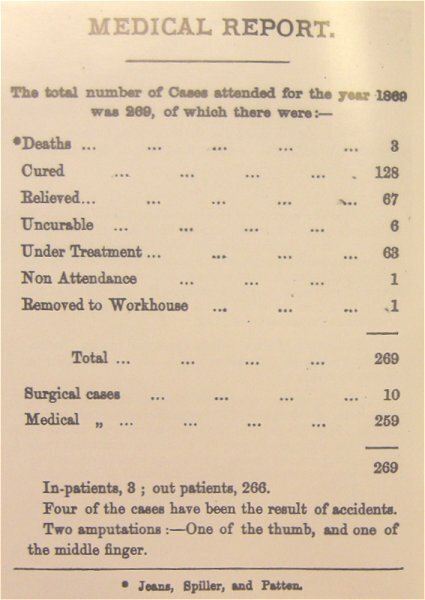 The number of patients treated during the past year amounts to 273 which number, added to those admitted since the establishment of the dispensary in March 1857, makes altogether 888. Many of these having attended several times, the actual number of attendance amounts to 1900. Sufficient proof is that given of the successful working of the charity to encourage me to persevere in my efforts in its behalf. I trust therefore ultimately to receive much more encouragement from the affluent and charitable in the Town of Yeovil, than I have hitherto received. My desire is to make the dispensary in every way efficient, but also quite free, and this can only be done by increased professional assistance, which I shall be but too pleased to obtain, and extended pecuniary aid; thus the entire labour which now falls upon myself, might be distributed amongst others as well, and a most useful and excellent charity might be more effectually organised and carried out, which would tend to the benefit of the poor of the town and neighbourhood. You will observe that I have received during the past year a donation of £5 5s 0d towards the funds of the charity. This, together with increased subscriptions, has enabled me since the closing of the account, to dispense with the payments of the patients themselves on their first attendance, which last year amounted to £5 a 13s 10d. ET Warry, MD and FRCS Exam." Associated with Doctor Warry at the Dispensary were Dr Russell Aldridge and Dr W Ford Bennet. Dr Bennet had been a military surgeon during the Crimean War (1853-1856) and worked at Scutari Hospital with Florence Nightingale. William Alfred Hunt became the Surgeon-Dentist to the General Dispensary in 1869, and later to the Fiveways Hospital. The regulations pertaining to patients of the Dispensary are quite interesting (especially the last three!) and reproduced below. Dr Warry died on 16 September 1866 in Sidmouth, Devon, aged 64. The Yeovil General Dispensary carried on after his death but was rapidly outgrowing the facilities at Kingston. A plot of land at Fiveways was purchased for £410 in 1868 as the site of a new hospital. When the new hospital opened in 1872, the Yeovil General Dispensary was closed. 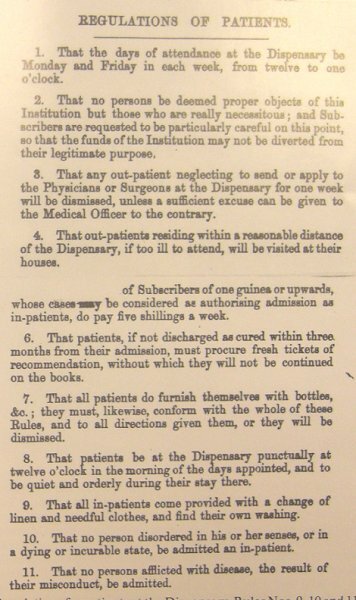 The medical report of 1869 outlining the number and types of cases dealt with at the Dispensary.